(Bloomberg) -- Nippon Paint Holdings Co. agreed to buy Australia’s DuluxGroup Ltd. for A$3.8 billion ($2.7 billion) in cash, giving it access to the country’s No. 1 sales channel for paints and coatings, as well as sealants, adhesives, garage doors, cabinets and architectural hardware. 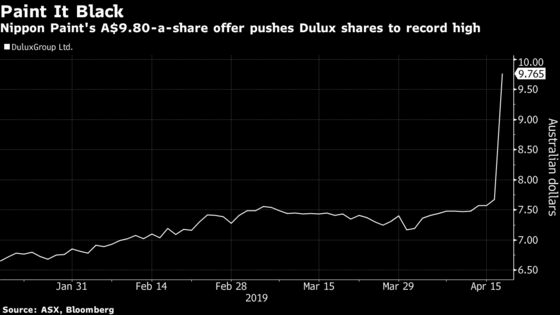 The offer by Japan’s biggest paint maker to pay A$9.80 for each Dulux share represents a 28 percent premium, the companies said in a statement Wednesday. In terms of large deals, that compares with Sherwin-Williams Co.’s offer in 2014 to buy rival Valspar Corp. for about $9.3 billion at a 35 percent premium. It’s the biggest acquisition yet by Nippon Paint, which has said it’s looking to buy global rivals to keep pace with consolidation in a $140 billion global industry where the top 10 suppliers account for more than half of sales worldwide. The Osaka-based company made a bid in 2017 for Axalta Coating Systems Ltd., the world’s largest maker of coatings for cars, though the offer failed to produce a deal. Axalta had a market value of about $8 billion at the time. “This is a logical acquisition, given the strength of the Dulux brand name in the Australian and New Zealand markets, the attractive stable growth potential of the region, and the opportunity the acquisition affords to bolster Nippon Paint’s regional portfolio,” Atsushi Ikeda, an analyst at Citigroup Global Markets Japan Inc., wrote in a note to clients. Although Dulux is Australia and New Zealand’s top paint and coatings company, it ranks at 22nd in the world, according to data compiled by Bloomberg. Dulux shares shot up to close near the offer price in Sydney trading, while Nippon paint fell 3.6 percent in Tokyo. Dulux will retain its name and leadership team that will operate as a division within Nippon Paint as the Japanese company adds Australia and New Zealand to operations in Asia, Europe and the U.S., the companies said. Dulux had sales of A$1.84 billion in the year ended Sept. 30. Nippon Paint’s offer values the company at about 2 times revenue, compared with the 2.43 times median for global paint and coatings maker deals, according to data compiled by Bloomberg. Nippon Paint has an A credit rating from Rating and Investment and Information Inc., which said Wednesday it is monitoring the company for possible downgrade. Nippon Paint had cash and equivalents of about 164 billion yen as of Dec. 31., and net cash of about 97.3 million yen. The deal is on track to be completed in August, the companies said. Dulux is being advised by Macquarie Capital Australia Ltd., while Nomura Holdings Inc. worked with Nippon Paint. Dulux shares have more than tripled since the maker of its namesake paints was spun off from industrial chemicals and explosives company Orica Ltd. in 2010.